At the end of last year I was approached by the founders of the hugely successful Healthy Selfie App, Charlotte and Jo Li, about a brand new fitness app they were developing to bring online workout guides to life and give everyone access to high quality workouts designed by Personal Trainers, at the fraction of a cost of a PT session. I jumped at the chance to be involved and am honoured to be featured as one of the trainers with workouts in the launch version of the Kaizen App, which went live in the App Store yesterday (10th April 2016). Once our workout filming was complete, I caught up with Kaizen’s co-founder, Charlotte about how Kaizen came about, the development process and the future of online training. First and foremost, could you explain what Kaizen is and how its going to work? Kaizen is a mobile app designed to help gym goers get access to quality interactive workouts from industry professionals. It’s perfect for those stepping foot in the gym for the first time to those who’ve been working out for years. Users can browse, search, compare and download programmes to suit their needs, while personal trainers can use it as a platform to extend their training worldwide. Unlike the traditional e-book which is the only way online guides are currently available, Kaizen makes the programme completely interactive. Users simply tap through their workout and we do the rest for you… And that includes giving you a preview of your day’s workout, timing your rest periods, and keeping track of your progress. The thing that sets us apart from the other fitness apps currently available on the market is the fact that the guides the users are buying are designed and developed by real people and real industry professionals – not by a computer generated algorithm! How did you come up with the idea for Kaizen? Where does the name come from? When we initially launched Healthy Selfie, our first app (www.healthyselfieapp.com), the ultimate goal was to create an app that would allow you to buy your programme in app and interact with it in a really intuitive way – e-books are SUCH an old fashioned way of consuming information. Today, there are 132 million gym goers in the world. Over half of them are using workout DVDs or online training guides. In this era of smartphones & technology we identified that there was a much more efficient way of delivering this type of content to these users. One year down the line, and here we are getting ready to launch Kaizen… We truly believe that this will change the face of the health and fitness industry. The work ‘Kaizen’ is Japanese for “continuous improvement”. This is fitting for both apps as we believe one’s fitness journey is a lifestyle change, an ongoing process – not something with a beginning and an end. How did you and your husband come about working on fitness apps together – what are your backgrounds? Although neither of us have a specific background in health and fitness, we are both avid gym goers and are always keeping up to date with the latest fitness trends. Our CEO, Joe, has a background in graphic design and web development – he’s responsible for designing each screen you’ll see on the app… And should take credit for creating the most beautiful fitness app out there! I qualified as an accountant in 2013 and continued to work in the industry until June 2014. I was working for my company on a secondment in Hong Kong and I just thought, life’s too short, I’m young enough to try something new and fitness is my passion – so I resigned and started working full time on the apps. I haven’t looked back since! Given this is now the second app you’ve developed, do you think that the future of fitness is moving more online? I think the future of everything is moving online! As technology becomes more advanced, people are constantly searching for more efficient and convenient ways of doing things. You can pay in a shop with the tap of an iPhone, why on earth would you still want to print off a 100+ page PDF document and lug it to the gym with you?! You’d be amazed how many people still do that. Additionally, online training meets the needs of those people who might not have the disposable income to hire a PT, yet still want someone to tell them what to do when they workout. Mens Fitness magazine actually predicted that one of the Top 10 Fitness Trends for 2016 would be Online Training – so the launch of Kaizen is really coming at the perfect time. What advice would you give to anyone thinking of developing their own fitness app? Think about it carefully before you do it! Because there is such an abundance of apps in the App Store, many people assume it’s easy to snap your fingers and release your own app. We are lucky at Kaizen to have a founding team that encompasses everything from technical to design to social media to finance. Without this, you will be paying an app agency a LOT of money to make your app and you should be prepared for that. Not only that, but you can’t just release an app and expect people to download it, even if it is free – there are thousands of apps launched on a daily basis and you have to think about marketing in order to make it a success. Secondly – remember that the average user retention rate for apps is only 10%. Yes, 10%. That means 90% of people that download your app will most probably delete it after 5 minutes or never use it again… So make sure you really believe you are delivering value and quality when you develop it. Finally, if you do launch your own app, remember to focus on quality – not downloads! This is something we have learnt from launching Healthy Selfie. It was a free app so our primary focus was to get high volumes of downloads. With Kaizen, we are paying much more attention to what the user wants and how to make it an amazing app. It’s far better to have 100 people who love your app and use it everyday, than 1,000 people who never open it. Ahead of the Kaizen launch, what are you most excited about? I just can’t wait for people to use it! Having been using it myself whilst we are in the testing phases, it has completely transformed my workout… I want others to experience the same thing. What kind of workouts do you like to do yourself? Have you filmed any workouts for the app yet that you’re dying to download and try out?! I have been SO inspired by all of the different training methods we have seen throughout our filming for the app – we have everything ranging from Hypertrophy to HIIT and Calisthenics to Core Workouts. I will be trying all of the guides at some point or another as the content is so tempting. Currently I’m in the process of training after having a baby so I’m keeping it reasonably simple for now (lots of bodyweight stuff), but will be working my way back to more strength training which is what I did pre pregnancy. Lastly, how and where can people download the Kaizen app, and when will it be launching? 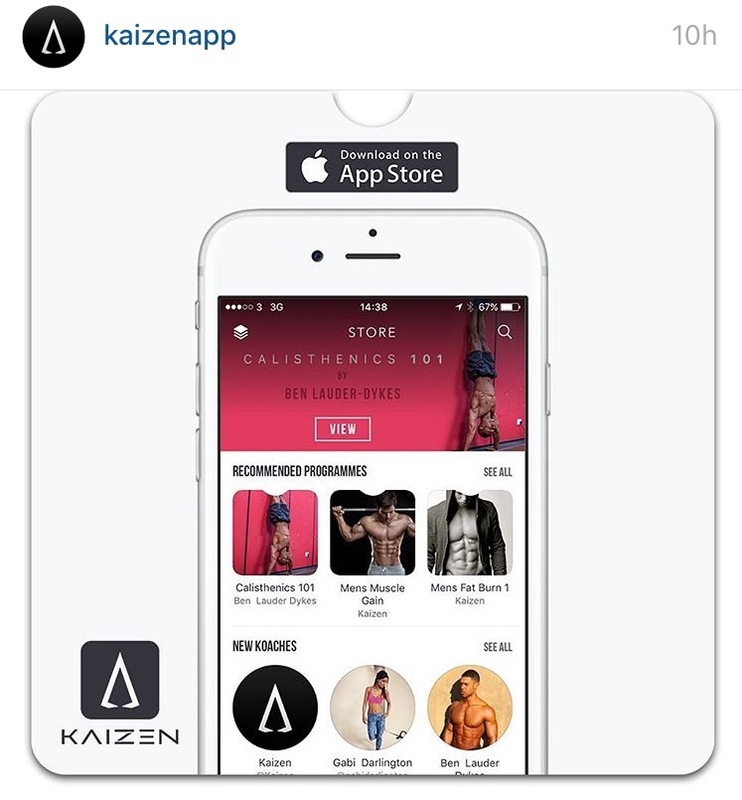 The app will be available for download on iOS on the Apple App Store on 10 April 2016 and for anyone interested, they can check out our website here: www.kaizenapp.co. Now that the app is live you have your chance to experience not one but two workouts with me – a full body BOSU workouts and a full body Kettlebell workout – if you guys download and try them please let me know how you get on. And don’t forget to let me know if there are any other type of workouts you’d like me to create for the App? So excited to be part of this incredible digital fitness revolution!